● Four insulation test voltages. ● Insulation resistance; auto ranging on all ranges. 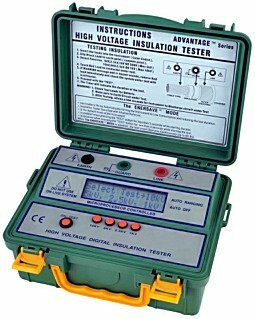 ● Measures insulation time test. ● Visual and audible warning if external voltage is present. ● EnerSave™ feature to extend battery life. ● 2 Lines × 16 characters large LCD. ● Show test time duration (up to 99.9s) for easy comparison. 7000 Vac for one min.